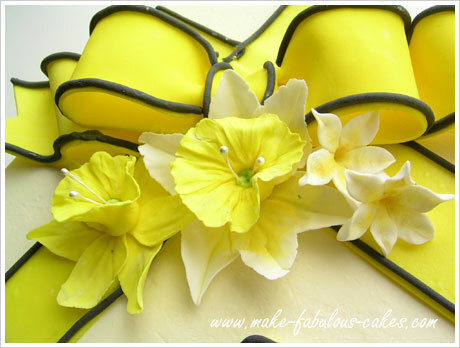 A perfect way to celebrate a spring birthday is with a daffodil cake. Daffodils for me really signify the coming of spring. 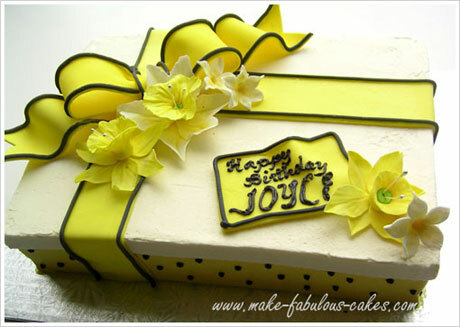 Though the daffodils in my garden are yet to come, I made them bloom in my kitchen with this daffodil gift box cake. 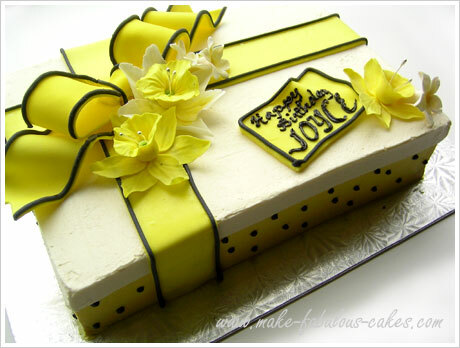 I love gift box cakes, especially when you are giving the cake as your gift. Serves a double purpose - it's your gift in a form of cake that everyone can enjoy! For this daffodil cake, I used a 9" x 13" sheet pan. I transformed it into a gift box following the Easy Gift Box Cake Tutorial . I made the base of the cake with yellow buttercream and the lid white. Black buttercream spots were then added randomly. For the decorations, I made the fondant bow and flowers using gum paste . I made the daffodils using the Gum paste Daffodil tutorial . Make the flowers and bow ahead of time to allow to dry. 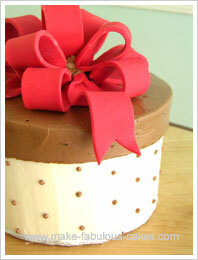 For the bow, the black border was made by extruding the gum paste with a clay gun with a round die attachment. I find that this gives a more uniformed string of gum paste. I moistened the edges of the bow with water and sort of "pipe" the black string of gum paste directly to the bow. This way it doesn't stretch the string too much. So, let's bring it back to the other view. Ahhh much better. 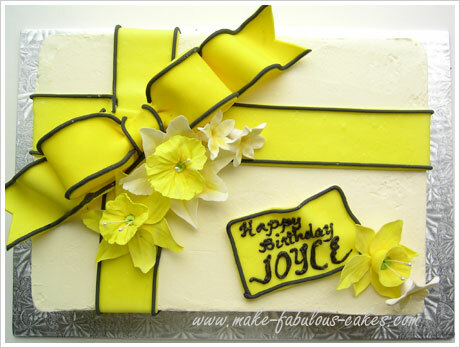 Enjoy this daffodil flower birthday cake!